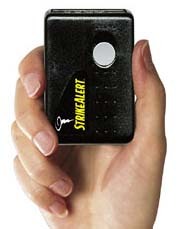 StrikeAlert is a small and affordable lightning detector that provides an early warning of approaching lightning strikes from as far away as 40 miles and lets you know if the storm is coming your way. An audible alarm sounds when there’s a strike and a corresponding LED light illuminates accordingly at lightning distances of 20-40 miles, 12-24 miles, 6-12 miles and within 6 miles. The detector is housed in a small pager-like casing that can be clipped on a belt loop and runs on a two AAA batteries.